It took two years of rehabilitation and determination, but eventually Glenn was able to walk unaided again. He then taught himself to run again and by the age of 12 was defeating all of the local high school runners. 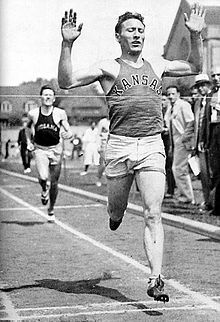 He went on to attend Kansas University, where he became known as the Kansas Flyer and built a reputation as a world-class miler. Several world records followed and Glenn successfully competed in the 1932 L.A. Olympics, where he came fourth in the 1500 metres and the 1936 Berlin Olympics, where he won a Silver Medal. Throughout his career, he was constantly in pain and required a significant amount of massage just to run, but he never let it hold him back, constantly developing effective training regimes and race strategies that enabled him to maximise his performances. He had every reason to feel sorry for himself and just accept his unfortunate lot in life. Through perseverance, optimism and sheer hard work, Glenn Cunningham managed to overcome significant obstacles and is known by many as America’s greatest miler in history. There will be times when you feel like giving up because the obstacles in front of you seem too great to overcome. There will be times when you look at your past and think that it is holding you back from greatness. When you feel like that, remember Glenn Cunningham. A young man who looked down at his scarred, wounded legs and, instead if using them as an excuse, used them to achieve phenomenal deeds! You said it – what an extraordinary man!!! Truly inspirational. Thank you for sharing!